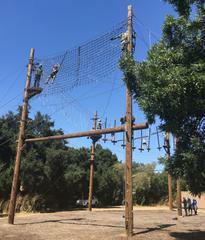 From June 22, 2017 through July 26, 2017, the Los Angeles County Sheriff’s Department’s Industry Sheriff’s Station’s Youth Athletic League (YAL) gave an opportunity for approximately 200 young adults ranging from ages 14 to 16 to participate in a 3 day summer camp the YAL likes to call Camp COURAGE (Community Opposition and United Resistance Against Gang Evils). The first week started with a girl’s camp of at least 50 then alternate weeks had two other boy’s camp and another girl’s camp with at least 48 participants each week. 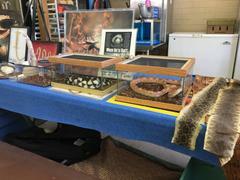 Each day, the children are taught teamwork through several team building exercises and competition games, participate in various forms of entertainment like karaoke, movie nights, arts and crafts, nature hikes, campfires, archery, high ropes and low ropes challenge courses, rock climbing courses, and an educational reptile show. The Industry Sheriff’s Station YAL, started well over 20 years ago with the support of now Captain Timothy Murakami, it was established in 1991 in response to the alarming rise in gang related homicides, assaults and drug trafficking in the community. The goal was to provide sports activities to at-risk children as an alternative to criminal behavior. Now boasting several programs from baseball, basketball, flag football to Judo, Kenod, scuba diving, one of the most predominant programs has been the camp. Serving 200 children from throughout Los Angeles County, Captain Murakami said “This program takes several Department members who donate their time to assist in running the services at the camp. From my YAL staff to the countless other participants from other sheriff’s stations, as well as LASD reserve deputies, California Highway Patrol officers, explorers, and volunteers, we are all here for the children to ensure they have an opportunity to get away from the city and enjoy nature”. Camp COURAGE not only provides an opportunity for the these children to enjoy life outside of the city for a few days, it also allows the children to connect with deputies, bridging a gap and establishing mentors to whom these children can contact later for advice, help, or to just keep in touch. Staff members have commented that their dedication and commitment to the program is very important to them, and to hear children speak about how it was the best time they have ever had, proves it is a success. 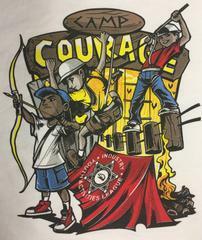 Anyone wanting more information or is interested in signing up their kids in one of the most enjoyable camping experiences of their lifetime, please call Deputy Scott Adamson or Deputy Jeffrey Domingo, Industry Sheriff’s Station’s Youth Athletic league at (626) 330-3322.